"Ace of Spades" redirects here. For the Motörhead song, see Ace of Spades (song). For other uses, see Ace of Spades (disambiguation). The ornate design of the ace of spades, common in packs today, stems from the 17th century, when James I and later Queen Anne imposed laws requiring the ace of spades to bear an insignia of the printing house. Stamp duty, an idea imported to England by Charles I, was extended to playing cards in 1711 by Queen Anne and lasted until 1960. Over the years a number of methods were used to show that duty had been paid. From 1712 onwards, one of the cards in the pack, usually the ace of spades, was marked with a hand stamp. 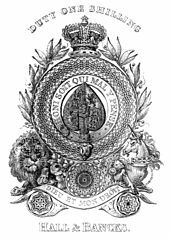 In 1765 hand stamping was replaced by the printing of official ace of spades by the Stamp Office, incorporating the royal coat of arms. In 1828 the Duty Ace of Spades (known as "Old Frizzle") was printed to indicate a reduced duty of a shilling had been paid. The system was changed again in 1862 when official threepenny duty wrappers were introduced and although the makers were free to use whatever design they wanted, most chose to keep the ornate ace of spades that is popular today. The ace of spades is thus used to show the card manufacturer's information. The exact design of the ace card was so important, it eventually became the subject of design patents and trademarking. For example, on December 5, 1882, George G. White was granted US design patent US0D0013473 for his design. His ace design was adorned with male and female figures leaning onto the spade from either side. The ace of spades has been employed, on numerous occasions, in the theater of war. In the Second World War, the soldiers of the 506th Parachute Infantry Regiment of the American 101st Airborne Division were marked with the spades symbol painted on the sides of their helmet. In this capacity, it was used to represent good luck, due to its fortunate connotations in card playing. All four card suits were used for easy of identification of regiments within the airborne division following the confusion of a large scale combat airborne operation. Battalions within the regiments were denoted with tic marks or dots, marked from top clockwise: headquarters at the twelve o'clock position, 1st Battalion at the three o'clock, etc. Some twenty years later, a folk legend about the ace of spades being used by American Soldiers during the Vietnam War was popularized. Supposedly, US troops believed that Vietnamese traditions held the symbolism of the spade to mean death and ill-fortune and in a bid to frighten and demoralize Viet Cong soldiers, it was common practice to mockingly leave an ace of spades on the bodies of killed Vietnamese and even to litter the forested grounds and fields with the card. This custom was said to be so effective that the United States Playing Card Company was asked by Charlie Company, 2nd Battalion, 35th Infantry Regiment to supply crates of that single card in bulk. The plain white tuck cases were marked "Bicycle Secret Weapon", and the cards were deliberately scattered in villages and in the jungle during raids. The ace of spades, while not a symbol of superstitious fear to the Viet Cong forces, did help the morale of American soldiers. It was not unheard of for US Soldiers and Marines to stick this card in their helmet band as a sort of anti-peace sign. More recently, in 2003 a deck of most-wanted Iraqi playing cards was issued to US Soldiers during Operation Iraqi Freedom, each card had the picture of a wanted Iraqi official on it. Saddam Hussein got the nickname "Ace of Spades" as that card bore his image. There is the French expression fagoté comme l'as de pique—that is, "(badly) dressed like the ace of spades." Richard Harding, hanged in London for forgery of the duty stamp on the ace of spades and knowingly selling playing cards with the same in 1805. ^ For an example of the card referring to race, see Aaron McGruder, Public Enemy #2: An All-New Boondocks Collection (New York: Three Rivers Press, 2005), front cover. ^ "The Tarot Death Card". Archived from the original on 2007-12-26. Retrieved 2009-02-11. ^ Hughes, E (2004). The English Stamp Duties, 1664-1764. 56, no.222 (April 1941). English Historical Review. p. 245. ^ a b Schott, Ben (2004). "Card Tax & The Ace of Spades". Schott's Sporting, Gaming & Idling Miscellany. London: Bloomsbury Publishing. p. 62. ISBN 0-7475-6924-X. ^ "Our History". Bicycle Playing Cards. Retrieved 14 December 2018. ^ Gandhi, Lakshmi, "Is It Racist To 'Call a Spade a Spade'? ", Codeswitch, National Public Radio, September 23, 2013 (retrieved June 14, 2014). ^ "As", Cassell's New French Dictionary (5th ed., 1951). Wikimedia Commons has media related to Aces of Spades. This page was last edited on 12 April 2019, at 18:26 (UTC).